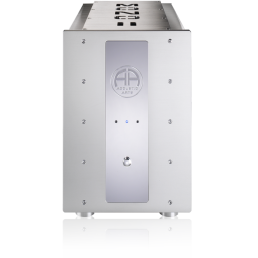 The ACCUSTIC ARTS® MONO II is the first amplifier from our company designed as a mono amplifier. The MONO II is based on the legendary AMP II, which enjoys worldwide popularity. The typical, cube-like timeless ACCUSTIC ARTS® design of the housing with its Bauhaus style is now continued with the MONO II. The slim design of the housing makes MONO II excellently suited to positioning near to loudspeakers. As is usual at ACCUSTIC ARTS®, during the development of the MONO II a high priority was the perfect signal feed with short distances and the use of the finest components. The printed circuit boards are only populated with components with very narrow tolerances. Selected components relevant for the sound are even tested manually to achieve an even higher selection standard. This effort is necessary to realise the technically perfect measurement values which form the basis for the exceptional sound experience of this amplifier. The MONO II is purely a mono output amplifier. This guarantees the best values, e.g. with channel separation and signal to noise ratio as each channel has its own housing. Particular care was taken with the materials used in the MONO II to enable high performance with extremely low distortion. For example, the 1200 VA strong toroidal transformer made in Germany is manufactured from a special core, is encapsulated and additionally protected with Mu metal shielding. Eight enormous power supply capacitors manufactured in Germany to our specifications with a respective individual capacity of 10.000 µF supply 12 carefully selected MOSFET output transistors with perfect direct current. This means at full load the used components are hardly pushed to their performance limits and therefore with understatement ensure a carefree, agile acoustic pattern. In most application cases the MONO II works in so-called CLASS A mode. The MONO II is able to effortlessly play back a deep, powerful bass sound and at the same time reproduce fine details and is therefore quite rightly a product of our reference series. As with all ACCUSTIC ARTS® amplifiers, the driver stage of the MONO II works on the proven principle of the current mirror. This circuit principle enables power to be drawn from an existing current. The MONO II is therefore a “power-controlled” output amplifier whereby the large number of MOSFET transistors ensures a very high current capacity without having to stretch the transistors to their performance limit. The MONO II is therefore also suitable for impedance critical or low-ohm loudspeaker systems. Ingenious circuitry removes the need for a servo controller for the “offset” and the quiescent current is generated via the IC or current mirror driver. As a result, direct and alternating current errors (DC and music signal errors) are immediately corrected. This means the total offset is exclusively determined by the quality and symmetry of the used ICs. Each MONO II has a generously dimensioned cooling surface which ensures a constant operating temperature of the MOSFET transistors. Even at full load there is never the danger of overload as the integrated control unit continually monitors the operating states of DC offset, temperature, clipping and high frequency. If a pre-defined value of one of these parameters is exceeded, the loudspeaker outputs are immediately switched off. This ensures the highest operational reliability for the output amplifier and the connected loudspeakers at all times. The generous dimensions of the components and the use of proven technology means the MONO II will give its owner many years of listening pleasure. If, however, a problem should ever arise, the ACCUSTIC ARTS® service with its reputation for quality will be happy to assist you.